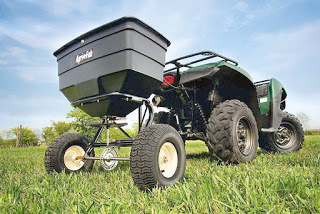 Fertilizing machinery is a kind of machinery used to fertilizing plants on a farm. While, pest control machinery is a kind of machinery used to controlling pest on a farm. Both of this machinery mostly spread machinery, because fertilizing and pest control machinery have a function, i.e can to spray plant on farm. A broadcast seeder (broadcast spreader) is a farm implement commonly used for spreading seed, lime, fertilizer, sand, ice melt, etc., and is an alternative to drop spreaders/seeders. Read the label of the seed or fertilizer package to find the recommend setting for the speed rate gauge on your broadcast spreader. Conduct a test run on a clean driveway or sidewalk. Notice how wide your broadcast spreader spreads. Measure to see how much square footage was applied with the material. Sweep the area of the material and collect to reuse. Do not wash it out onto your lawn, garden or street. A sprayer is a piece of equipment that spray nozzles to apply herbicides, pesticides, and fertilizers to agricultural crops. for example: Rogator Spraying Corn applying pesticide to a corn field. A manure spreader or muck spreader or honey wagon is an agricultural machine used to distribute manure over a field as a fertilizer. 17 Responses to "Fertilizing and Pest Control Machinery"
Learning to be a newcomer to the spot we'd have liked a reliable dog or cat secure infestations control option. By Out Insect Services is a fantastic organization to work with and it's been versatile with this routine for Pestwiki.com Service. We've got the wonderful plan today and also sense their expertise complete the job right . The pest control business has grown more than 50 percent in the last 5 years or so, and nationwide it has become a $7 billion industry. This is likewise a decent post which I truly delighted in perusing. It is only one out of every odd day that I have the likelihood to see something like this..